Clyde was marching confidently through the garbage. He didn’t feel tired or hungry, his high spirit driving him forward. The light breeze that was always present around here kept him company. He began whistling and was soon further away from the bunker than he has ever been before. The sun set and the moon was replacing it, accompanied by countless stars. To Clyde’s’ luck, there was a beat up mattress leaned against a pile of trash. He pulled it down and climbed on top, curling up, hugging himself. He realised he forgot his blanket and his warm clothing. It was thankfully summer and by the end of autumn, he would already reunite with his mother. He calmed himself down with that thought and fell asleep quickly. In his dream, he saw a silhouette of a woman reaching her hand to him, calling his name, beckoning. With that, he woke up. It was already sunrise. The clouds far away were turning pink, with the brightening sky serving as a background. Clyde shivered and stood up. He was hungry, but decided to wait until the sun was up. He got up and continued his journey, trying to warm up. He decided the faster he travels towards the sun, the faster he will see it and began running, laughing as the sun showed its first rays, shining right into his eyes. He ran out of breath, but continued to walk quickly. When he was younger, he learned that if you stared long enough at the sun, resisting the urge to cover your eyes, the sun would begin to look blue and you would actually be able to see its spherical shape. He occupied himself with that, occasionally looking away to not go blind, seeing dark blotches everywhere. Once the sun was high enough to light everything, he stopped and got out his first can of beans. He looked around, found a brick and began rubbing the can on it. It was a rather time-consuming procedure, but a good seven minutes to guilt trip yourself for forgetting the can opener. Next time, he thought, I will definitely remember. Next time… he stopped rubbing the can and looked around. there was no sign of his beloved family. He would be happy to see anyone, even aunt Lisa having another panic attack. But the wastelands were deserted. Clyde knew he wouldn’t come back until he found his non, but he wanted Mr. Morrison and the rest to search for him and find him. Would there ever be a Next Time? Clyde felt his eyes getting wet, but shook the sadness off, resuming to stubbornly rub the can. In about a minute, the liquid began dripping out of it and Clyde put his lips on the hole he made, drinking everything out thirstily. He finished up his work and ate some of the beans, sparing the rest for later. The can returned to his bag and he was walking once again. Homesick thoughts were crawling back into his head. He was beginning to doubt his decision. A crow was circling above him and Clyde decided to strike a conversation. He told the crow about his worries. He told it that Mr. Morrison is probably worried. He probably needs his watch back. Clyde took more than one can of food for himself and he felt bad for that too, considering how much effort is usually put into finding one. He could begin digging through the garbage, but he had no time to do so. He had to walk eastwards. The crow screeched as if asking Clyde why he was walking. Clyde smiled, beginning to regain his confidence. He told the crow about his mother. He said she left to a better place and wanted to take him with her, but couldn’t carry him all that way. She needed him to grow up before going there. It’s probably a place for adults only, but they could make an exception for him. The crow screeched again and Clyde chuckled. The crow seemed satisfied with that answer and flew away somewhere. Clyde wished the crow followed him, but it seems it had better things to do than listen to the ramblings of a little boy. 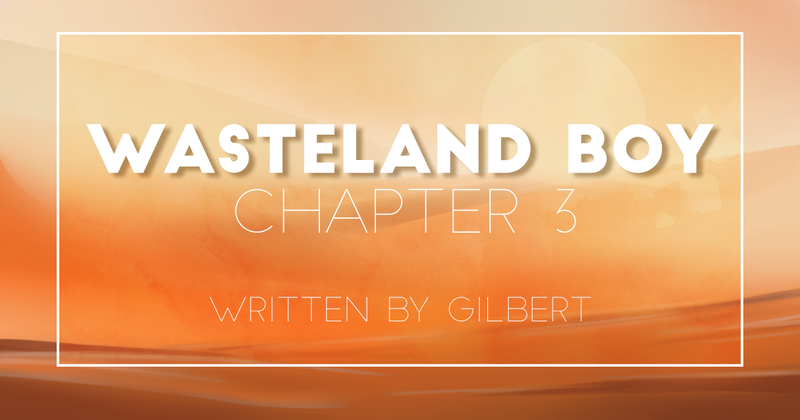 Clyde concluded that the wastelands aren’t so lonely after all. He heard from the elders that there are many people out there living in bunkers like them. Sooner or later, he was bound to bump into one of them. While searching for a place to sleep, he dug out a perfect pair of brass goggles. One of the adults in the bunker had a pair. He used them to protect his eyes from winds and would always wear them around his neck, so Clyde didn’t hesitate to follow the lead. There was nothing to lay on. Clyde collected lots of used up paper and made himself a bed. It was even colder that night and he couldn’t fall asleep for a while. In the darkness, he heard some sound resembling a siren. The sound didn’t have such frequency though, it was closer to a voice. It was responded with a similar sound somewhere closer. Clyde sat up and howled too, laying back down, satisfied with his participation. He soon drifted off into sleep. Previous Previous post: The Gaming Mammoth has a date – with you!